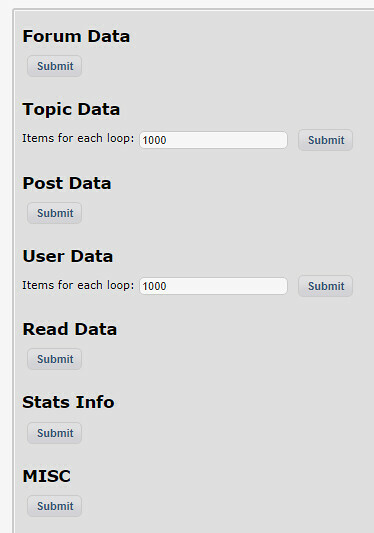 SiteURL/modules/newbb/viewpost.php?status=new View New Posts link at bottom of main forum page or from the drop down at the top timing out the site with to many requests? Trying to work out if problem with our updated site running 2.5.9 along with newbb 4.33Final or if there is an issue at our hosts end? 2/3 1:27 We're running 4.33 Final here as well, but I don't see any problem here. Did you check your error logs to see if there is something else going on? 2/4 17:34 After trying a sync forums and getting a lack of access to the site completely unable to reach the db, the site recovered after 20 minutes and no longer caused the time out it is now working as it should. So not sure if the host had problems or newbb, one thing I noticed the sync forum didn't come up with the choices page as the older version used to. Bit odd but now the site is functioning fine.